David O’Connor was inducted into the USEA Eventing Hall of Fame, along with his partner, Custom Made, in December 2009. He had been best known for his most recent Olympic accomplishment – bringing home the first Eventing Gold Medal for the United States in more than a quarter of a century, which he accomplished on Custom Made at the 2000 Olympic Games in Sydney, with the best score in Olympic history. He also competed Giltedge in Sydney, helping the USET capture the Team Bronze medal. David followed up on his Olympic successes in 2001 by bringing home his third Rolex watch aboard Giltedge. 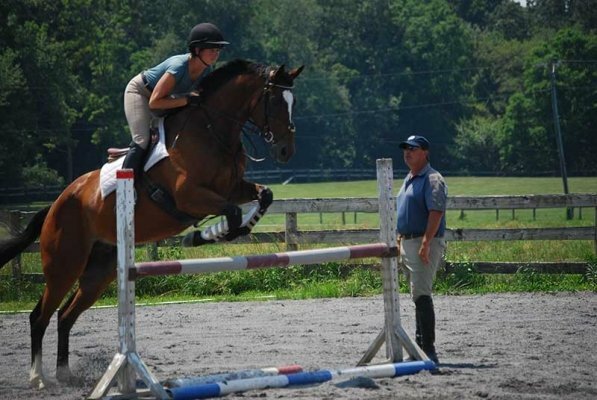 He also finished third at that event with Custom Made, and went on to win the 2001 USET Fall Eventing Championship at Fair Hill International riding The Native. In 2002, David led the US Eventing Team to a Gold Medal at the World Equestrian Games in Spain, riding his long-time partner Giltedge. He followed that up with another win at the Fair Hill International aboard his Olympic Gold Medal horse, Custom Made, and was subsequently named Rider of the Year by USA Equestrian. In 2003, David was awarded the prestigious Wofford Cup, which is given to individuals who have made outstanding contributions to the sport of Eventing in a non-riding capacity. David was the first rider ever to receive this award. David has competed internationally for the United States Equestrian Team since the late 1980’s, beginning at the 1986 CCI*** Alternate World Championship in Bialy Bor, Poland, on Border Raider. Since then he has earned 3 Olympic Medals, 2 Pan American Games Medals, and two World Equestrian Games Medals. He’s won Rolex twice as a three-star and once as a four-star. He’s won Fair Hill International CCI*** five times, and in 1997, he became only the second American in history to win the coveted Badminton CCI****. As well known as David is for all his riding accomplishments, he is also very proud of the fact that his horses are well known stars and celebrities in their own right!